“don’t need you” is a documentary film that tells the story of the origins of Riot Grrrl in the American independent music scene of the 1990s, and how this feminist movement evolved into a revolutionary underground network of education and self-awareness through music, writing, activism, and women-friendly community. The film gives audiences a chance to meet key figures in the development of Riot Grrrl and see for themselves how these women have changed the history of music and feminism forever. 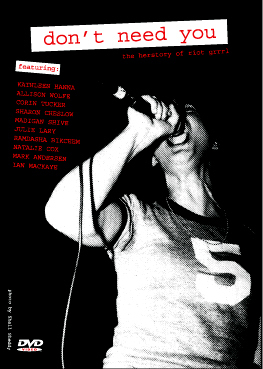 The film features one-on-one interviews interspersed with rare, archival materials, including original Riot Grrrl fanzines, flyers, and photographs, as well as seldom seen footage from pioneering Riot Grrrl bands like Bikini Kill, Heavens to Betsy, and Bratmobile. We’d like to apologize for the absence of extra footage from Sharon Cheslow and Julie Lary. Their footage got destroyed in an unfortunate dv player meltdown. Their contributions to the film were countless and we thank them for all of their wisdom and support.